Auditions for THE HUNDRED DRESSES, directed by Dawn Truax are scheduled for : April 15 and April 16 at Stageworks Theatre. 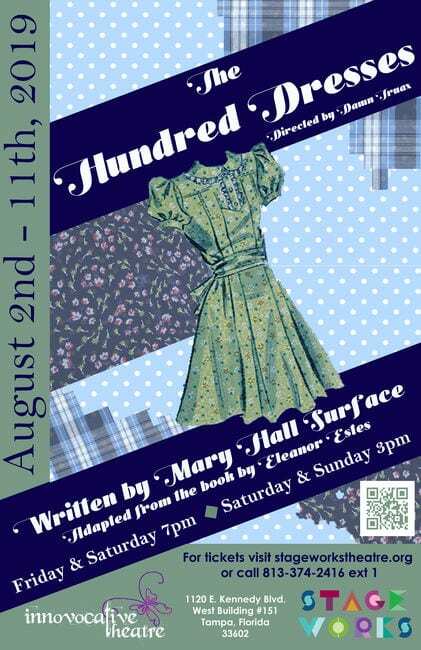 Innovocative Theatre will be holding auditions for their August co-production of THE HUNDRED DRESSES. THE HUNDRED DRESSES, based on Eleanor Estes’s book, is a story about, Wanda, young Polish girl, who is teased by her classmates for wearing the same dress to school every day. Wanda claims she has a hundred dresses at home. Despite her conviction, the children know she does not and they bully her daily as “a game.” After Wanda’s family moves away, Maddie, one of Wanda’s classmates realizes it’s too late for apologies. Child actors should compose a brief paragraph describing their bedroom. Paragraphs should be no more than 6 sentences. Please memorize this paragraph for the audition and bring it with you. Adults will read from the script. Wanda Petronski: 10-12-year-old girl, who is very shy, soft spoken and watchful child. From a very poor Polish immigrant family that lives in the bad part of town. Feels like an outsider but very much wants to fit in. Madeline (or Maddie) Reeves: 10-12-year-old girl, imaginative, playful and thoughtful. From a family suffering economic uncertainty which she tries to cover. Has good intentions but isn’t really sure of herself. Peggy Thomas: 10-12-year-old girl and the most popular girl in school who is very strong, confident (maybe a little bossy at times) and very verbal. Madeline’s best friend. From a well to do family. Not a mean girl but not a very sensitive one either. Cecile Allen: 10-12-year-old girl, prim, well dresses, well-spoken but a little silly. From a very well to do family, she sometimes puts on airs. Jack Beggles: 10-12-year-old boy, fun, smart, very earnest and a dreamer. Loves mechanical things, comic books. Willie Bounce: 10-12-year-old, boy, a big talker, prankster, fun, high energy and full of adventure and dares. Miss Mason: 30’s or 40’s, warm hearted, compassionate but no-nonsense school teacher. Everyone’s favorite teacher. Jacob (Jake) Petronski: 12-14 years old, Wanda’s brother, who is a bit cynical and hardened by poverty and life in the US. Devoted to his little sister. Mr. Svenson: 50’s-60’s, a reclusive and lonely old man. A bit gruff but not unkind. Mr. Petronski: Wanda’s father, a Polish immigrant who speaks broken English, works hard to support his family. Played by the actor who also plays Mr. Svenson. Adult actors will be compensated. Child actors will receive a stipend. Please email your headshot/current photo and you resume to innovocativetheatre@gmail.com. Actors will be seen in one hour blocks. Request your time preference: 6-7:00, 7-8:00, 8-9:00 PM. We will do our best to accommodate your request.